The early days at Morris Motors were exciting ones. The first Morris appeared in 1913 when one William Morris constructed a car of his own creation at his very own factory in Cowley, England. Morris cars were rugged and grew popular quickly with the British motoring public. The marque’s success was assured after The Great War ended in 1918. By 1925 Morris found itself in the enviable position of being King of the Hill--able to boast it was the best selling car in Great Britain. The company expanded with the purchase of suppliers like SU for carburetors and Hotchkiss, an engine manufacturer. Morris himself was honoured by being knighted as Sir William in 1928 and then made a Lord in 1933. During World War Two the company turned its attention from producing automobiles to cranking out aircraft for De Haviland. 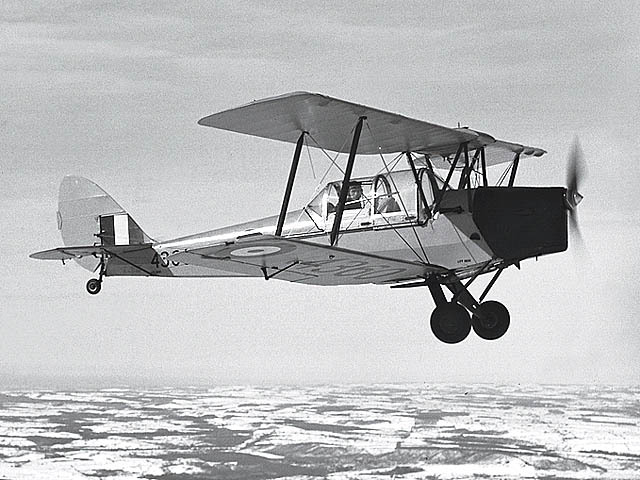 The Cowley facility was dedicated to building Tiger Moths for victory. While workers at the plant manufactured aeroplanes, Lord Nuffeld dreamt of a future where the world was at peace. His assistant, Sir Thomas Miles, hired Alec Issigonis, a young designer, to create a small personal car for the post-war buying public. 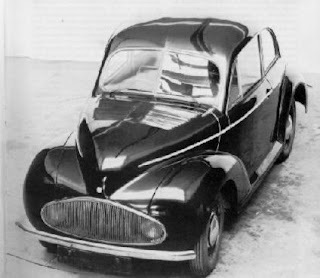 1943 Morris Mosquito prototype designed by Alec Issigonis. Initial plans called for the little vehicle to be called the Morris Mosquito. The look that took shape under Issigonis’ capable hands was extremely aerodynamic with headlights hidden behind the grille, front fenders that disappeared smoothly into the body and running boards shorn from the envelope. When he finally saw the vehicle, Lord Nuffeld absolutely despised the look, calling it a “poached egg.” Ready in early 1947, the completely finished vehicle languished for a full year while awaiting orders for destruction. Lord Nuffeld finally decided to build the car but personally ordered the changes that were seen in production models. Headlights migrated outward from the grille to the fenders. 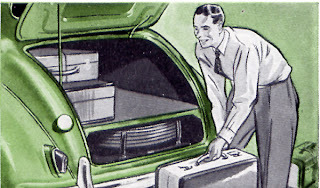 There was the suggestion of a running board. 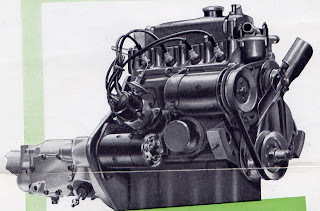 A flat, four-cylinder engine was ultimately nixed and the existing Morris power plant was used, though frameless, unit construction was kept. Capacious trunk boasted seven cubic feet of space. Note the unique location of the spare tire. 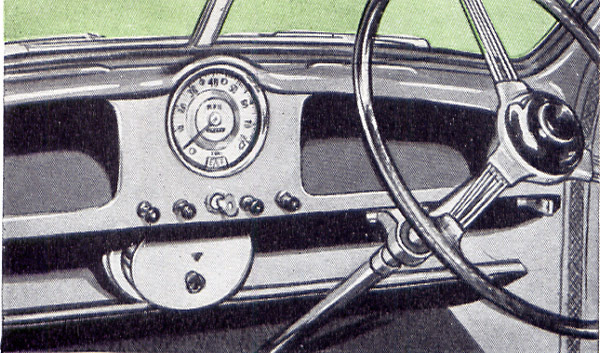 The name was changed from Mosquito to Minor and the substantially changed car debuted at the 1948 British Motor Show held at Earl’s Court in London. The petite Morris Minor was the belle of the ball. Journalists fell over themselves in their attempts to pen superlatives about the adorable set of wheels. Despite effervescent words from the press, sales were slow; fewer than 1,000 Morris cars sold in the UK in 1950. Most were sold abroad as Britain focused on paying off its substantial war debt to the United States and Commonwealth countries under its 'Export for Dollars' scheme. The little vehicle did very well in Canada where sales of 7,561 Morris cars were recorded. 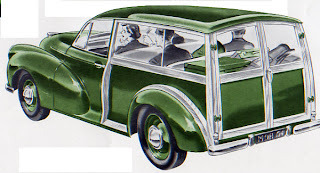 The following year Morris sold 1,945 units in the US and 1,192 units in Canada. 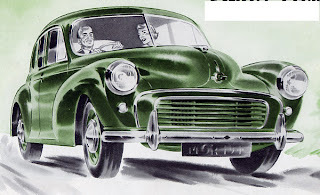 Back in Britain, Morris tied the knot with former archrival Austin to form the British Motor Corporation, a.k.a. BMC. 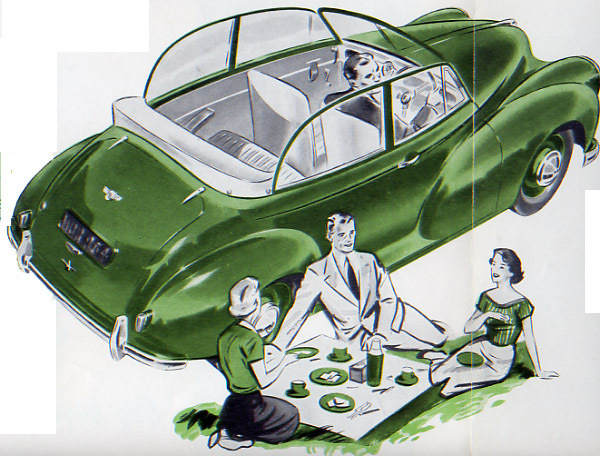 Morris sales were miniscule in the US and racked up sales of 2,304 units in Canada in 1953. No doubt sales were helped some by the addition of a station wagon. Though prices were held the same for all models in 1954, sales were a modest 995 units in the USA and only 1,022 units in the Dominion of Canada for 1954. Morris Minor Traveller Estate Car cost $1,968 in 1955. Examples of that bigness included torsion bar independent front wheel suspension, seating for four within the axles, a 12-volt battery, safety glass and a Panoramic vision windshield, hydraulic brakes, rack-and-pinion steering, double shock absorbers a four-speed shifter and more, All this was loaded onto a pint-sized 86-inch wheelbase. with a price tag of $1,665. The Minor was delivered as a convertible with fixed window rails, a four-door sedan and the Traveller two-door station wagon. The wagon’s back seat dropped perfectly flat to give a good-sized cargo area. horsepower—enough to take the car to 62 miles an hour. showed the right-hand drive instrument panel setup. The Minor was well appointed to seat four “and an occasional five.” No, I am not making that up! 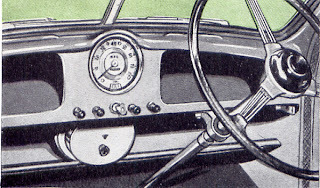 Standard equipment included carpeting, a heater, ashtrays fore and aft, bucket seats, wiring for a radio and a jack. Optional equipment included a sun visor for the front-seat passenger, bumperettes and Vinyde leather-cloth covered seat cushions. Colour choices were short and sweet: Black with maroon upholstery; Clarendon Grey with maroon upholstery, Smoke Blue with maroon upholstery and Empire Green with green upholstery. was built in Cowley, England. Great blog!! It is quite interesting and I enjoyed a lot.